The JIS (Japanese Industrial Standard) Magnesium K1A headform is currently used for Uniaxial (Z direction) impact tests on helmets. 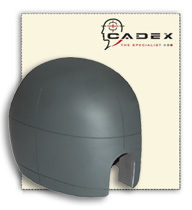 The headform has been designed to meet the JIS T 8133 and other standards. Testing lines are CNC grooved. Each headform is shipped with a technical data sheet. In the JIS standard, there are 3 headform sizes : Small, Medium (standard) and Large. We hold all these sizes in stock at all times.